As a professional Chinese interpreter, I will work side by side with you during your duration of stay here and ensure that you can communicate fluently with your business partners, taxi drivers, restaurant servers, or any others that will help make your stay easier. China has grown exponentially over the past few years into the biggest global market and each year, thousands of businessmen fly here to meet potential business partners or a prospective client. Upon arrival, foreigners are usually floored at the warmth of the Chinese locals. But the caveat is that they have very limited English speaking skills or none at all. It goes without saying that most people who arrive here do not have the faintest idea of speaking in Chinese or Mandarin either. I have over seven years of professional experience in working as a Chinese mandarin interpreter and am friendly, courteous and skilled. I have worked with international businessmen and women travelling to china, looking for a Mandarin Chinese interpreter as well as with tourists who are awed by the many splendors that china has to offer. Why you need a professional Chinese interpreter in china? 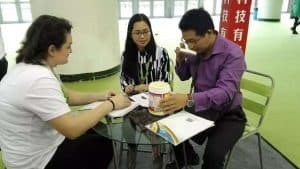 Besides the obvious language barrier that I mentioned above, it is crucial that you have a skilled and trained Chinese English interpreter with you, because it ensures that the correct message is given to the counter party. I have witnessed deals go awry due to poor or sloppy translation done by inexperienced interpreters. If it’s a business deal, you only get one chance to make an impression. Don’t take chances. I have a large team of Chinese interpreters and translation services that has an immaculate track record. We can provide references and you can also check testimonials on our website. But my services go beyond offering business translations. I am also a skilled personal China tours guide and arrange customized tours for anyone looking to visit any part of china. If you are here for medical reasons, then I can work with you as a Chinese medical interpreter and make your hospital visits and follow ups stress free. You can get your much deserved relaxation while I do the talking and convey the precise feelings that you wish to convey. One of the advantages that I bring to the table is that I can offer my translation services anywhere in China. So, if you are looking for China interpreters in shanghai or a Chinese English interpreter in Beijing, then you are at the right place. Our team of interpreters is growing each day and we can get you a skilled interpreter in no time, awaiting your arrival at the airport. Exceptionally skilled in all three languages, English, Chinese and Mandarin, all members of our team are able to provide flawless English to mandarin Chinese interpreter services. We strive to provide you with the best service and quality. So, if you need a China interpreter service, or maybe you just want a Chinese female travel companion, then look no further. You have come to the right place to hire a translator in China. To hire a China interpreter just fill out the form on this page to request a free quote.